Therapists are supposed to make clients safe and secure, creating a cozy haven from a cruel world, right? Well, when it comes to treating anxiety and OCD, growing evidence shows that the quickest, most effective approach involves instructing them to ramp up their fears while telling themselves how much they welcome the experience. 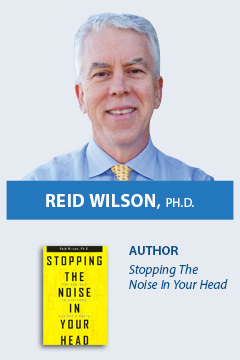 Join internationally-recognized expert and author Reid Wilson, Ph.D. to study what cutting edge research is showing us about the possibility of rapid change. Dr. Wilson will outline the treatment strategy, step-by-step, and illustrate each stage with brief, professionally videotaped segments of therapist-client interaction within the first two sessions of treatment. Reid Wilson, Ph.D. is Adjunct Associate Professor of Psychiatry at the UNC School of Medicine. He is author of Stopping the Noise in Your Head: The New Way to Overcome Anxiety and Worry and the classic self-help book Don’t Panic: Taking Control of Anxiety Attacks. He is co-author of Stop Obsessing! and Anxious Kids, Anxious Parents. He is a Founding Clinical Fellow of the Anxiety and Depression Association of America (ADAA) and Fellow of the Association for Behavioural and Cognitive Therapies. Chapel Hill, NC, March 28, 2014– Dr. Reid Wilson was presented with the nation’s highest honour in his field of anxiety disorders at the Anxiety and Depression Association of America’s (ADAA) Annual Conference held this week in Chicago. Dr. Wilson is only the second person who has ever received this award, presented to the one professional who exemplifies excellence and outstanding advocacy for patient education and care, training, and research. Dr. Wilson has dedicated his 30-year career to developing self-help strategies for the anxiety disorders. He is the author or co-author of four self-help books, including Don’t Panic: Taking Control of Anxiety Attacks (Harper), Stop Obsessing! : How to Overcome Your Obsessions and Compulsions (Bantam), the newly-released Anxious Kids, Anxious Parents: 7 Ways to Stop the Worry Cycle and Raise Courageous and Independent Children (HCI Books), and it’s free companion e-Book, Playing with Anxiety: Casey’s Guide for Teens and Kids. Dr. Wilson volunteers as the expert for WebMD’s Anxiety & Panic Community. His free self-help website – www.anxieties.com – serves 500,000 visitors per year. He designed and served as lead psychologist for American Airlines’ first national program for the fearful flier. Dr. Wilson served on the Board of Directors of ADAA for 12 years and served as Program Chair of the National Conferences on Anxiety Disorders from 1988-1991. He has offered trainings throughout the world in the treatment of anxiety. He is Associate Clinical Professor of Psychiatry at the UNC School of Medicine and directs the Anxiety Disorders Treatment Center in Durham and Chapel Hill, NC. The Jerilyn Ross Clinician Advocate Award honours the memory and lifework of Jerilyn Ross, cofounder of ADAA and president from 1985 to 2010. Clinical Professionals: All mental health professionals including, but not limited to Clinical Counsellors, Psychologists, Psychotherapists, Social Workers, Nurses, Occupational Therapists, Hospice and Palliative Care Workers, Youth Workers, Mental Health Workers, Addiction Specialists, Marital & Family Therapists, Speech Language Pathologists, Vocational Rehabilitation Consultants, School Counsellors, Behaviour Specialists, Rehabilitation Consultants, Geriatric Specialists, and all professionals looking to enhance their therapeutic skills. When booking hotel rooms, ask for the Jack Hirose and Associates corporate rate. To receive our corporate rate, rooms must be booked one month prior to the workshop date. Please keep in mind hotel rates may fluctuate. All fees are in Canadian dollars ($CAD). Fees do not include applicable taxes (5% GST). To receive the early bird rate, registration and payment must be received by Wednesday, November 6, 2019. Please review our Registration Terms and Conditions for information on our cancellation policy, payment policies, rebates, and more. You must agree to our Terms and Conditions to register for a workshop or conference. All brochures and forms are provided in .PDF format. If you are unable to open our files, we recommend downloading Adobe Reader for free.